More information: Almost two years earlier, the four musicians of Van der Graaf Generator had already played with the idea of getting back together again. When Peter Hammill had a heart attack in 2003, he was not the only one feeling the urge to get that planned project to finally happen. "There had been a strong feeling of unfinished business", David Jackson remembers. This DVD and 2CD gig from the Jazzfestival in Leverkusen was the climax of the reunion-tour in 2005. 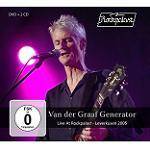 The band knew that it was going to be filmed and recorded professionally - something that was extremely rare in the history of Van der Graaf Generator. The gig also coincided with Peter Hammill?s 57th birthday. The first gentle flute notes of the opener opened a door into the past and Van der Graaf Generator played as energetically, dark and seductive as in their zenith in the mid 70s. Peter Hammill's voice was as powerful as ever which is very much outstanding regarding his eccentric, headstrong but most importantly emotional vocal style. But above all things, this gig is a document of honest devotion not only between the band and their fans but between the band members themselves.